If you are planning a New Year get-together with your friends, but still searching around for some party food recipes, I am here to help out. To make this party planning a little less stressful for you, I am posting the links to some of the party foods recipes I have posted so far this year (there will be more by the end of the New Year…thanks for being a friend). Preparing these will keep you busy, but you will be basking in glory of compliments from your friends, as these are very popular and delicious party foods, which I personally tasted and used at my parties. Vegetable tray with dip – (selection of baby carrots, grape tomatoes, red, green and yellow peppers, cut up celery sticks , sliced cucumbers, with your favorite dip). Cheese and crackers – arrange different cheeses cut up to bite size pieces with your favorite crackers. Kobasa with party bread, or rye bread – Ukrainian or Polish smoked sausage, sliced up cold, or boiled for 20 minutes, cooled slightly, then sliced up. Canapés – If you still have some spare time, you can make small canapés with a bite size chunk of bread, dab of mustard (Kosciusko Mustard is really good), slice of kobasa, and top it off with a slice of pickle, spear it all with a fancy toothpick, and arrange these in a single layer on a serving dish. Looks great and tastes even better. 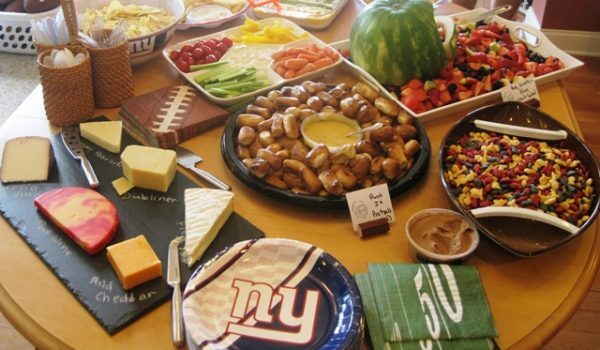 I am sure these will help you out for this party, or any other future parties you may host, since Super Bowl is coming up very soon. As for the rest of the party planning, let your imagination run wild.